Here at Kozzmozz, we do not tend to follow the latest trends or hypes. Techno is what we breathe. For 22 years we kept an open mind towards the music we love. This time will be no different. For our summer edition, we invited some top-notch artists who will bring the heat to the Vooruit in Ghent the 24th of June. First up to deliver sounds from another world is the new live-project of Blawan: Kilner Live. It has been two years since we had Blawan absolutely DESTROYING the dancefloor at Kozzmozz. Since then Jamie Roberts a.k.a. Blawan has not been sitting still. Not only touring as one half of Karenn and Trade, Jamie also released fresh beef under two new alias’s. Sonic experimentation at its highest level. Kilner, aka Blawan, promised his new alias was going to be wild. Entirely industrial, although the producer happened upon the sounds in an organic way. It’s corrosive and callous, but absolutely beautiful. His love for unusual sounds and modular weirdness comes to its right. Always trying to break the boundaries and push the frontiers of the wide spectrum of techno music. 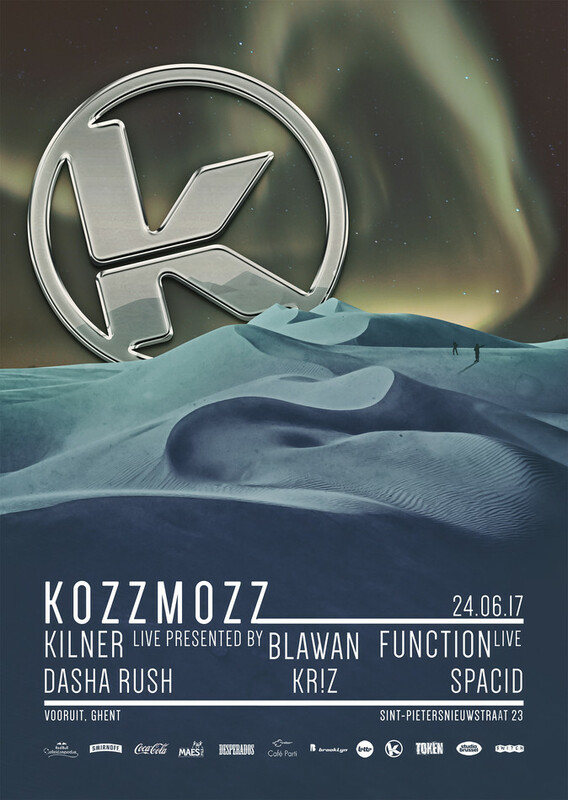 We are honoured to welcome Blawan presents Kilner at our next Kozzmozz mission. One of techno's true underground heroes, Function (Dave Sumner) has been DJing and making music for over 25 years. He is a founding member of the Sandwell District collective, Berghain resident, Ostgut recording artist and owner of Infrastructure. Hailing from New York, he was seduced by techno when Jeff Mills held residency (as well as his own first) at Limelight in the early 90s. Producing from the mid-90s onward, he released his first 12"s on Damon Wild's Synewave and his own Infrastructure imprint. In 2008 Dave moved to Berlin and put his focus on the acclaimed Sandwell District imprint. Since then the label has skyrocketed into cult status. In 2013 Function presented his debut album ‘Incubation’ on Ostgut Ton – a modern sound journey. The last couple of years, besides reinventing his label Infrastructure NY with label partner Ed Davenport, Function released the Berghain mix series: Berghain 07 and a remix of Planetary Assault System. Still at the forefront of redefining techno, he’s an artist we always love to welcome on board. Dasha Rush is a Russian-born artist who sees the genre as a starting place, not a destination. She combines her activities as a dj and techno producer on her Fullpanda imprint, which founded in 2005, with other multi-artistic collaborations alongside visual artists or dancers. Her album for Raster-Noton ‘Sleepstep’ is a metaphor for her work: dubby but intense, brutal but tender, foggy yet clear - Sleepstep was a wonderful mass of contradictions. Dasha likes to push the boundaries of contemporary dance music to the limit. Her Awakenings and Dekmantel appearances, combined with frequent club appearances at Berghain and Tresor, Berlin; Fabric, London, and other key techno clubs/parties around the world, proofs that she is a fixed value in the techno scene. Sounds like she will fit our line-up perfectly. And off course there’s also Kr!z. He has been a Kozzmozz resident for more than a decade now. He is the label head of the much hailed Belgian label, Token Records, but he’s much more than that. With consistent and impressive DJing and a tendency for long and immersive sets, he is a talented and capable artist in his own right. His busy DJ-schedule brings him all over the world, playing multiple times at Tresor and Berghain, to clubs reaching in Japan and Los Angeles. The night starts off with our resident Spacid. Spacid has been pushing underground electronic music for more than 25 years. It was back in 1995 when he founded the Funky Green Aliens collective, which at the time promoted the more experimental side of techno. Back then techno was still an underground phenomenon. The FGA became notorious for throwing (sometimes illegal) raves until the early 00’s throughout our country. Spacid has always kept an open mind towards the more creative musical concepts. His thirst for renewal is illuminated by his passion for music, which keeps him sharp. This vision led him to be a connoisseur of sound, keeping him relevant as a DJ for more than 20 years. Kozzmozz proofs once again their vision for quality eternal techno music. With the love for all Kozzmonauts, this time will be no different. Providing a top-notch sound- and light-system, this trip into outer space will be guaranteed one to remember. Alone we will dance together. Mark the date.